This is not another space exploration 4x or a privateer clone. This is a game about space combat. That’s it. The majority of the gameplay is dueling with other ships, flying maneuvers with allies and destroying the enemy. 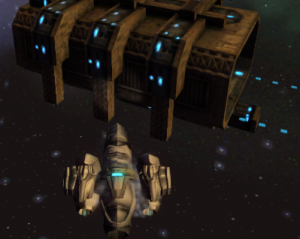 One of the main features of the gameplay is the ability to perform wild maneuvers inspired by shows like Battlestar Galactica and Firefly. We want to find the next Starbuck or Wash.
We released a first concept of the game to Kongregate in January of 2011. This allowed some basic maneuvering and mostly focused on player versus player combat. We learned quite a bit about what worked well and what didn’t work. We have recently released Longshot. This release will has much smarter AI than the kongregate version to make it fun to play single player, but also provide a lot of cannon fodder in the multiplayer games allowing a better mass combat feel. We also added engineers who can build automated turrets to develop a more tactically interesting combat space. We are conceptualizing a future release we call Longshot Universe. Although this may sound like yet another space exploration game, it is anything but… instead the galaxy is at war. Like a giant percolator, new fronts are constantly bubbling up providing many opportunities for an opportunistic merc to jump in on one of the two sides, fight the enemy du jour, win some credits and build a better ship. In Longshot Universe, you’ll be able to build you ship completely from scratch using parts you’re able to scavenge off your enemies or purchase in a star base. Each pilot’s ship will be completely unique and provide for some really eclectic battles. Take a look at the Universe tab to learn more about what we’ll be building into LSU.